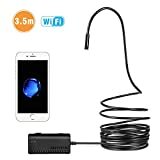 We told you about a sale earlier this week on the Depstech WiFi Borescope Inspection Camera and hundreds of readers took advantage. Well, the good news is the sale is still going strong, but the bad news is you’re running out of time to get in on the action. This awesome Depstech camera connects wirelessly to your iPhone or Android phone, which instantly becomes a remote viewfinder. You can then snake the borescope into anything and your phone will see all the action. You can even save videos if you want, or use one of the included attachments to pick up lost keys (hook attachment) or see around corners (mirror attachment). Use the coupon code G7NDDS5E at checkout and you’ll pay just $29.99, the device’s lowest price ever.